Specify the default enabling of the PROMPT_KEY parameter on DISPLAY, REQUEST and POP_UP RDML commands. When the prompt key is not enabled, the RDML command parameters must be used to specifically enable it. Yes indicates that pop-up windows created by LANSA should use the IBM i windowing facilities. Only relevant in an imb i i environment. 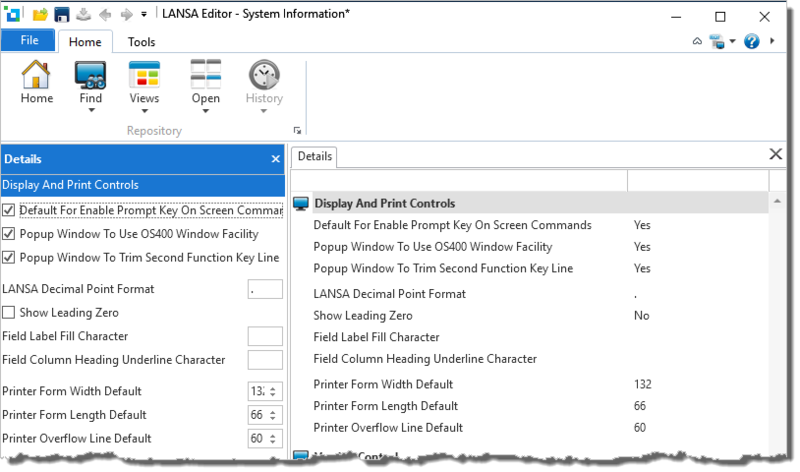 Yes indicates that an existing LANSA defined pop-up window has the 2nd function key line trimmed from the display. Only set this option to Yes if the Popup window to use OS400 window facility is Yes. This option enables existing functions that have been specifically sized onto line 24 of the display device to recompile without change. Mandatory. Default value is ".". Specify the character to be used for the decimal point. Specify the character to be used to fill the remaining space of the field label. Specify the underline character to be used for column headings. Specify the default width for the printer to be used in a 5250 execution environment. If no printer width is specified the system will use this default value. Specify the default printer for length to be used in a 5250 execution environment. If no printer form length is specified the system will use this default value. Specify the default printer overflow line number to be used in a 5250 execution environment. If no printer overflow line number is specified the system will use this default value.